Reflections from what turned into a pilgrimage to Oxford in 2004. I fell in love three times in Oxford. Apparently the first two times didn’t take since my fingers are still free of any wedding shackles. The third, however, is a different story, attested to by the fact I’ve returned once again to this jewel of the Southern landscape. Few places are so self conscious and intentional in their remembrance, celebration, and frustration of the region’s past, and so Oxford has a natural appeal for lovers of the South, her introspective citizenry, as well as inquirers in general. For some of us the appeal is indeed double and Oxford exists as something of a Mecca, a haven to which one can retreat from the busy mundane while furthering their investigation into things Southern. Presently I find myself in a state of spiritual reflection, sitting on the second-story patio of Oxford’s own cornerstone, Square Books. It’s hot and muggy as Mississippi can be in July, and I’m content with my iced tea as I gaze out at the courthouse and the rest of the square. It could be hotter. Much hotter, I suppose, and the breeze provides a nice respite from the blanketing heat the summer usually brings in this part of the world. A flood of memories and dreams come rushing back as I think of my own stint here. When I arrived as a graduate student late in the summer of 1995, I was green but ready to tackle the academic world, prove myself, leave a mark and move on. Truth be told, I was more nervous than excited, wondering what the experience would hold, and, as is the case for most, Oxford has left the greater imprint on me than I on it. And yet it is this community of Southerners and Southern inquirers that have collectively defined the university and the town. So I know, though I have come and gone, I have still contributed to the preservation of the Oxford way. It is said the University is buildings and trees, but Ole Miss is people and personality. I’m inclined to agree. The architecture and the landscape shape the place but they themselves have been shaped too by predecessor pilgrims who have likewise passed through. But the community no doubt is ever evolving while ever retaining something of the same. So as I ponder my own past, the people with whom I pilgrimaged rush to the fore of my mind. Professors, fellow students, God fearers, and dear friends-Watt and Wilson, Heather, Ryan, Marlo, and Scott, and Emily, Greg, Martin, Ben, Bart, and Monte. We’ve moved on and moved apart and calls and emails are rarer, yet their impact is with me still. In some metaphysical way they are alive and well in every thought I have and in every step I take. More poignant, however, is Laura Treppendahl. I didn’t know Laura as well as I would have liked, but I knew her well enough. She typified the epitome of what Jesus called the “pure of heart.” Her own love affair with Ole Miss (and Christ) was evident in her words and her smile, but it was an affair that came to a premature halt when her life was taken by a drunk driver – by one not taking full stock of what this place has to offer. Yes, Oxford has its demons, especially in its more publicized, segregated past, but the place is dearly loved still. A utopia I suppose it is not, but it is better than most places and a place that I love.Oxford is what it is, what it should be, what it was meant to be. It should always be so. Sorority Row – the best looking quarter mile in all of the Americas. 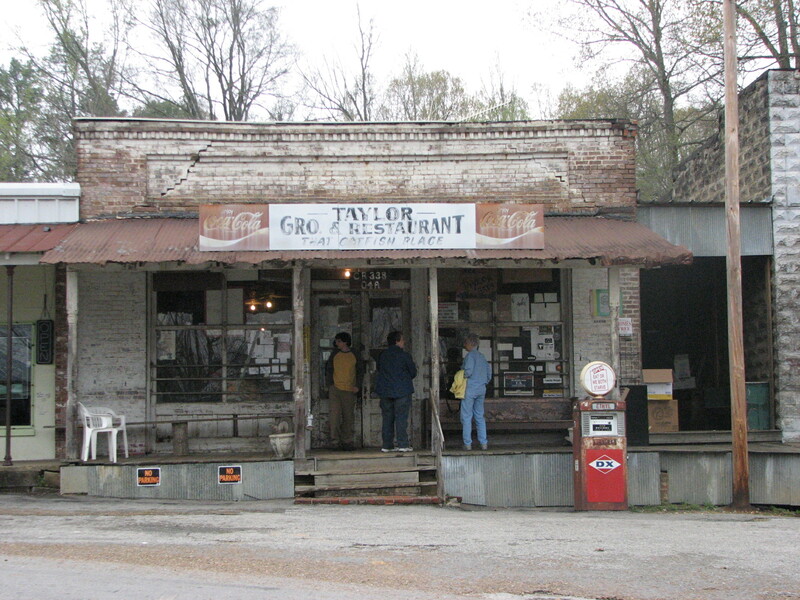 I’ve just returned from the comforting arms of a different kind of lover – Taylor Grocery and Restaurant. This local favorite lies about ten miles out of Oxford, away from the life of the university and square. Greeted by the sign “Eat, or We Both starve”, I figured I was headed in the right direction as I entered the rustic, dilapidated structure. Taylor’s claim to the “South’s Best Catfish” might be true – crispy on the outside and flaky on the inside. Nothing fancy here. Southern gourmet it is not. Simply put, plain ‘ol fried fish at its finest. The gumbo and beans and rice are nice complements too. When inside, there is no doubt you are in the South. Where else can a group of financial aid workers (50 or more) from a public university begin their meal with a prayer? Where else can you find a painting of the rebel flag sitting next to a depiction of the Last Supper? It’s enough to make one proud to be a Southerner – even if the rest of the country thinks we’re still a little backwards. With a flood of corporate chains on most street corners, there aren’t enough places like this anymore (local with a unique flair). Just slightly off the beaten path and good enough to draw people from all over, Taylor’s retains that uniquely local charm that sets it apart from the rest of the world. Relaxed, lively (they frequently have music but not tonight), tasty, quintessentially Southern – the perfect hole in the wall. Oxford, I must admit, is much like everywhere else in some respects. Many of its so called citizens are oblivious to the depth of beauty around them (as many of us are wherever we are). Sure, they understand this little corner is special, but for too many it runs no deeper, as they have little understanding of their greater impact and their community’s impact. For this lack of insight, I suppose they are not to be judged. We are all guilty of similar crimes at some point. They just run on as does the world around them, living, dying, never exploring greater and more ultimate purposes. But some do understand. I think of Dr. Wilson and his life’s task here – a noble and worthy endeavor. I think too of my fellow clergymen – a humble, yet influential calling. Oxford has its noblemen and sophisticates, as well as its commoners and socialites, but all are needed because they all have contributed to keep the spirit alive. Fortunately, Oxford is owned by none but is treasured by all, at least in my imagination anyway. My time in Oxford slips away and soon I will return to the real world. (Spent yesterday in another storied Southern town, Memphis–another tale for another time). Had breakfast this morning with a retired couple from Hot Springs, Arkansas. In speaking with them about this their first visit to Oxford, I’m clearly reminded once again of the enchantments of the place. I didn’t come for a spiritual or existential experience, but this pilgrimage has been just that. Being here (and reading Bonhoeffer at my leisure), I’m reminded of the mysterious nature of the spiritual. God isn’t limited to a particular place, nor is he confined by geography. He is all around, awaiting for us to open our eyes and our ears, even if such moments of power and clarity are often short-lived and passing. Nonetheless, they provide much needed bread for the journey. For me, Oxford has and does nourish well. My time here has been much too short, or so it feels, and as I prepare to leave Oxford, it seems I depart as quickly as I arrived…. And perhaps this too should be so. That’s a good piece of writing – I can feel the blanket of humidity and the partial comfort offered by an occasional gentle breeze – My memories of college in Oklahoma are similar; When there, I always have to visit the football stadium, just to sit and look at an empty field, and reminisce. I want to go to Taylor Gro. & Restaurant so bad I can hardly stand it.